Alfred Wright was born in 1895 and baptised on the 8th December 1895, in Wood Norton parish church, the son of William and Jane Wright (see Figure 1). The British Army WW1 Service Records 1914-1920 survive for Alfred, who gave his age on enlistment as 20 years 2 months, height 5’ 3¼”, chest 35½”, weight 9st 1lb, and his occupation as a ‘horseman’. Alfred enlisted in Norwich on the 6th November 1915, in the 3/1st Norfolk Yeomanry. He was posted overseas and left Davenport on the 15th September 1916, arriving in Salonica on the 30th September 1916. He was transferred from the Norfolk Yeomanry to the 179th Company, Machine Gun Corps on the 24th January 1917. On 20th June 1917 he left Salonica, arriving in Alexandria a few days later on the 23rd June 1917. On the 10th December 1917 the Casualty Form – Active Service records that Alfred had been wounded in action on the 8th December 1917 (a gunshot wound to the abdomen), and had died from his wounds (Alfred had been involved in the fighting to capture Jerusalem). He was 22 years old. 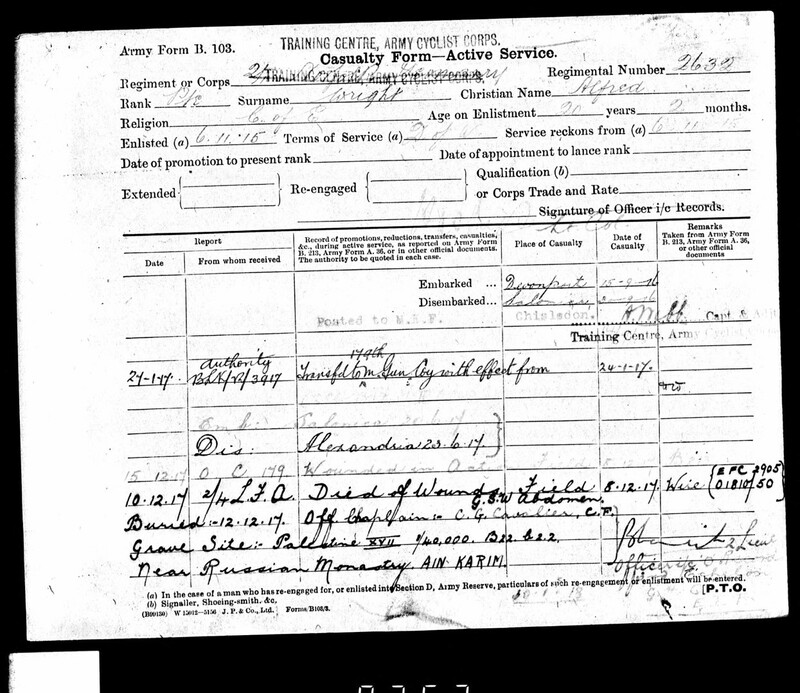 The Casualty Form notes that he was buried on the 12th December 1917, near the Russian Monastery at Ain Karim (in south-west Jerusalem) (see Figure 2). The Record of Soldier’s Effects lists two amounts paid in May 1918 to Alfred’s father William, as sole legatee – £10 2s 11d and £3 16s 4d. The Record of Soldier’s Effects also notes that Alfred died of wounds while in the care of the 2/4th London Field Ambulance, Palestine. A War Gratuity of £9 was paid to William in November 1919. At the outbreak of war Palestine was part of the Turkish Empire, but Allied forces did not enter Palestine until December 1916; the advance to Jerusalem took a further year. By the 21st November 1917, the Egyptian Expeditionary Force had gained a line about five kilometres west of Jerusalem, although the city was spared direct bombardment and attack. Very severe fighting followed, lasting until the evening of the 8th December, when the city’s prepared defences were captured. Turkish forces left Jerusalem throughout that night and in the morning of the 9th December 1917 the Turkish forces letter of surrender was handed to the Allies, and Jerusalem was occupied. The Jerusalem War Cemetery was begun after the occupation of the city, with 270 burials, but was later enlarged to take graves from the battlefields and smaller cemeteries in the neighbourhood. Alfred’s military headstone (No. 2075) bears the inscription chosen by his parents, Death Divides, But Memory Clings. Alfred was awarded the British War Medal and the Victory Medal. Further research into Alfred’s family reveals that his father, William Wright was baptised on the 22nd May 1864, in Wood Norton parish church, the son of Richard and Alice Wright. William married Jane Buck in December 1891 in Wood Norton parish church. In the 1911 census for Swanton Novers, William is recorded as aged 47 and a bricklayer working on the Estate; he died in 1954, aged 90, and is buried in Wood Norton. Jane was baptised on the 30th July 1865 in Stibbard parish church, the daughter of Robert and Elizabeth Buck. She died in 1950, aged 84, and is buried in Wood Norton. Alice Baptised: 30th October 1892, Wood Norton. In the 1911 census, Alice is aged 18 and a school teacher. Died: 1919 (Watford), aged 26. Alice is buried in Wood Norton. Edward Born: 15th July 1894, Wood Norton, and baptised 14th October 1894, Stibbard. In the 1911 census, Edward is aged 16, and a bricklayer’s labourer. Died: 1979 (Wood Norton), aged 85. In the 1911 census, Alfred is aged 15, and a general labourer. Died: 8th December 1917, aged 22. Palestine. Edith Baptised: 11th July 1897, Wood Norton. In the 1911 census, Edith is aged 14 and at school. Margaret Baptised: 21st August 1898, Wood Norton. In the 1911 census, Margaret is aged 12 and at school. Elsie Baptised: 3rd June 1900, Wood Norton. In the 1911 census, Elsie is aged 11 and at school. Mary Born: 1902, Wood Norton. In the 1911 census, Mary is aged 9. William Born: 1904, Swanton Novers. In the 1911 census, William is aged 7. Died: 1989 (Swanton Novers), aged 85. The Wood Norton War Memorial includes Alfred’s older brother, Edward, on the list of men who served in WW1, and survived. A memorial to Alfred is included on the headstone for his elder sister Alice, who died on the 25th February 1919, aged 26 and is buried in Wood Norton churchyard. The inscription to Alfred reads: Also Alfred, their second son, killed in action on Dec. 8th 1917, buried at Enab in Palestine, aged 22 years. Beneath the dedication to Alfred is another inscription: Also [in memory of] Arthur Robert Buck, uncle of the above, killed in action in France, May 25th 1918, aged 40 years. Arthur was Jane Wright’s younger brother. These inscriptions are followed by the words from Alfred’s military headstone, Death Divides but Memory Clings. 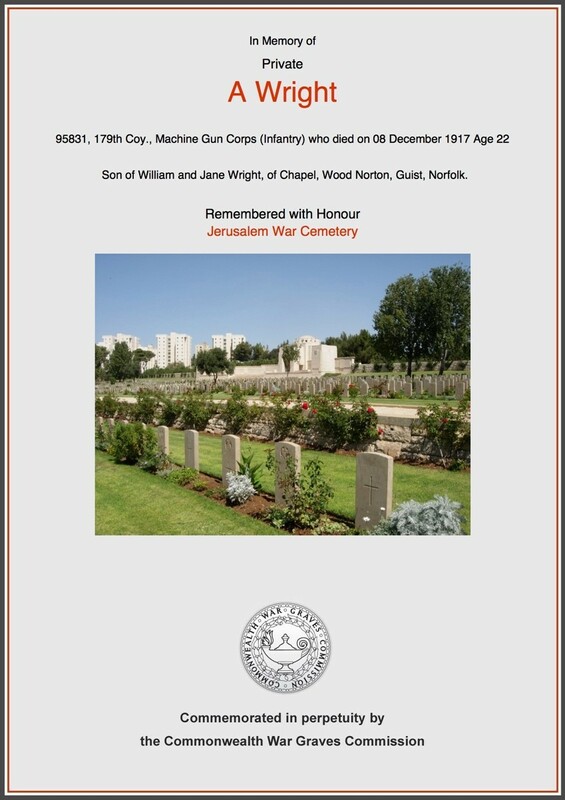 This entry was posted in Local collections and tagged Jerusalem War Cemetery, Wood Norton. Bookmark the permalink. Thank you for getting touch, I hope you liked the post. We are aiming to display information on all our serviceman at a Remembrance event this November in All Saints, Wood Norton. It would be wonderful if you had any more information on Alfred – particularly any photos – and if you were able to attend the Remembrance event.